, a French naval officer of great repute, was born in 1656, and bred to the sea-service under a: relation, who was a sea-captain, named Korbin-Gardane. In 1636, he was left by his commander the chevalier de Chaumont, in the service of the king of | Siam, to whom he was some time chief admiral. 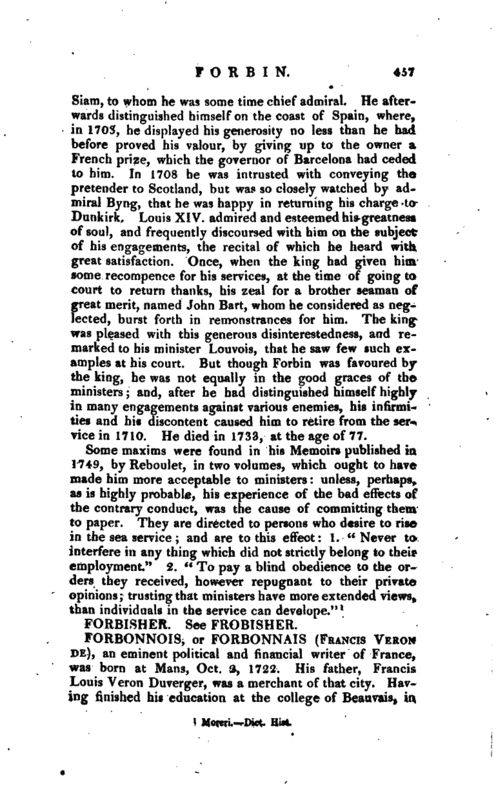 He afterwards distinguished himself on the coast of Spain, where, in 1703, he displayed his generosity no less than he had before proved his valour, by giving up to the owner a French prize, which the governor of Barcelona had ceded to him. In 1708 he was intrusted with conveying the pretender to Scotland, but was so closely watched by admiral Byng, that he was happy in returning his charge to Dunkirk. Louis XIV. admired and esteemed his greatness of soul, and frequently discoursed with him on the subject of his engagements, the recital of which he heard with great satisfaction. Once, when the king had given him some recompence for his services, at the time of going to court to return thanks, his zeal for a brother seaman of great merit, named John Bart, whom he considered as neglected, burst forth in remonstrances for him. The king was pleased with this generous disinterestedness, and remarked to his minister Louvois, that he saw few such examples at his court. 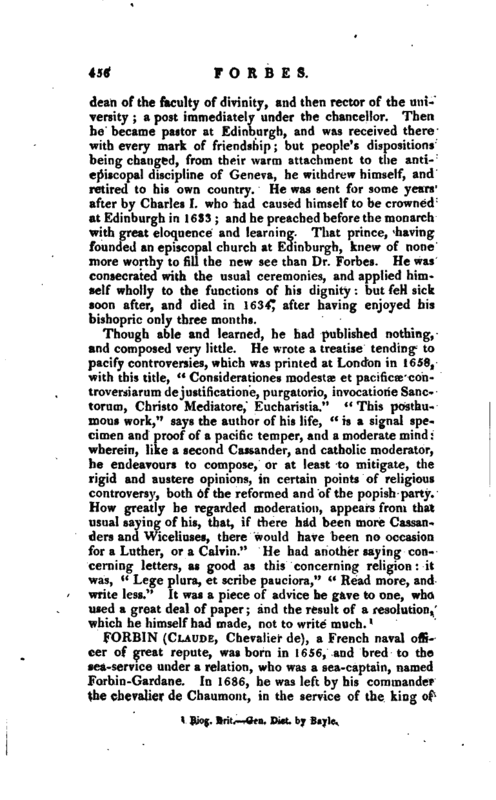 But though Forbin was favoured by the king, he was not equally in the good graces of the ministers; and, after he had distinguished himself highly in many engagements against various enemies, his infirmities and his discontent caused him to retire from the service in 1710. He died in 17:53, at the age of 77.